An agent who receives many internal extension calls and from where the calls originate. The reason for an increase in an agent’s handle time. 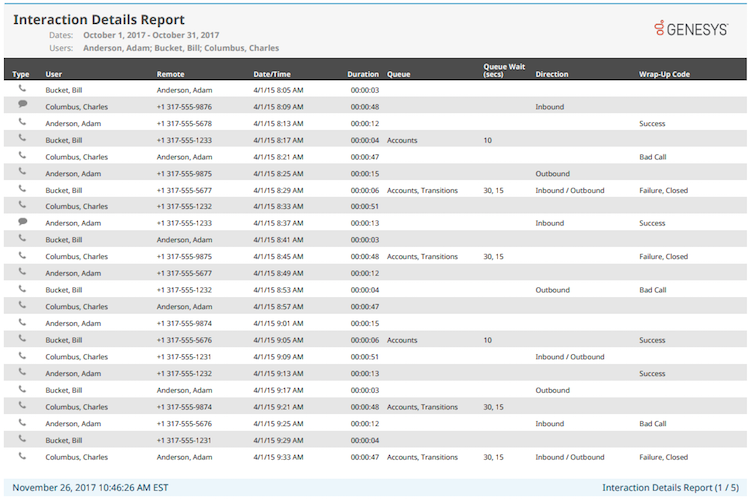 Use the report to identify whether a few calls or most calls took longer than average. User The agent who spent the most amount of time interacting during the interaction. Remote The remote number or participant that answered or started the interaction. Date/Time The date and time of the interaction. Duration The length of the interaction, including queue time and after-call work. The queues in which the interactions occurred. Note: Multiple queues separated with commas in this column indicate that the interaction occurred in multiple queues. Note: Multiple numbers separated with commas in this column indicate wait time for multiple queues. Direction The direction of the interaction. Inbound/outbound indicates that the conversation had multiple parts that were of opposing directions. For example, an outbound call to a queue’s external IVR contains both inbound and outbound segments. Wrap-Up Code Any wrap-up codes set for the interaction.